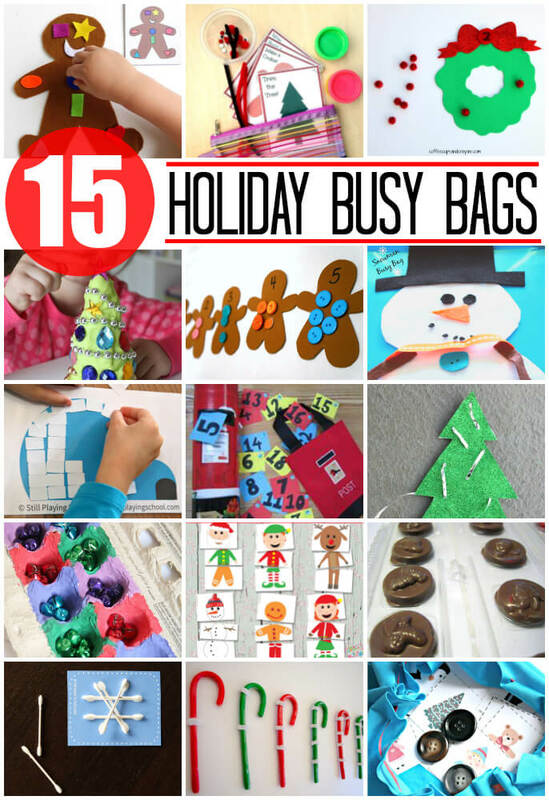 Have you discovered the awesomeness that is busy bags yet? They’re self contained activities that kids can do all by themselves again and again. They made great quiet time activities and are perfect for when you’re traveling or out to eat. Since Christmas is coming I thought it’d be fun to make a holly wreath preschool busy bag! This activity is perfect for preschoolers who are working on counting, number identification and one-to-one correspondence. This was super easy to make because I found a bunch of foam wreaths at the craft store! If you don’t see any you can easily just cut a wreath shape from green foam on your own though too. I cut red felt circles out and wrote numbers on them with the permanent marker because I liked how the felt stuck to the glitter texture. If you are making your own wreath you could easily cute red bows from foam and save yourself a step. 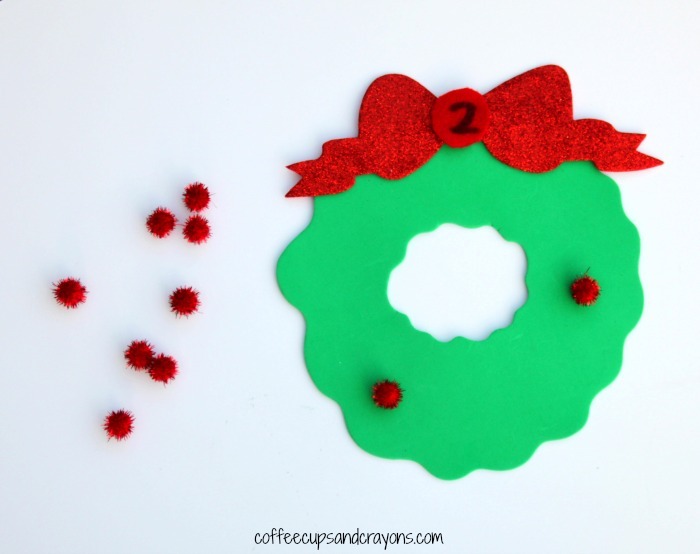 Then let you child choose a felt number and then add that number of holly berries to the wreath. You could even make a circle with the number word on it for them to read and count. When not in use store the busy bag in a gallon sized bag so you don’t lose any pieces and it can travel with you! Brilliant activity. I love how you dont need loads of wreaths but interchange the felt numbers. Lots of independent fun! 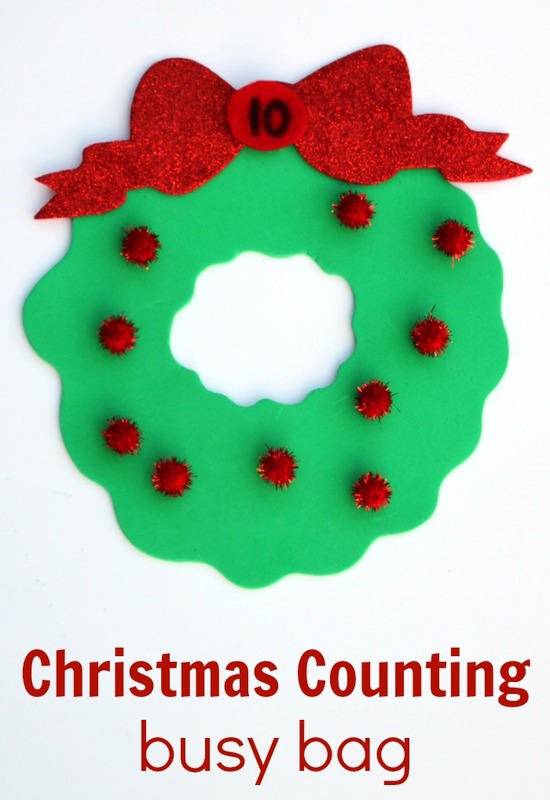 Lovely Christmas counting activity. My tot is a bit too young for this but I’ll save it for next year! What a cute idea! My daughter is just getting interested in addition and subtraction. I think this would be a great way to practice! Sooo cute! I love that the kids have fine motor and math practice too!